If anywhere is about power dressing, it must be Washington DC. Imagine what bargains are to be had in the second hand clothes shops. Americans don’t call them that, of course, it’s far too vulgar. No, they like to call them “consignment shops”. Secondi, near Dupont Circle is one of the better-established ones, situated in large, bright, comfortable premises over Starbucks. Set up by Caity Callison in 1986, it’s easy to spend several hours in here and impossible not to buy anything. 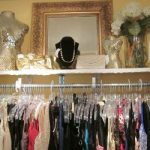 They specialise in designer wear and their website warns what items they won’t take – it sounds picky but it means the selection of items on offer is of a much higher standard than a thrift or charity shop. Turnover is brisk; manager Shannon Chichester, in post for 12 years, keeps the ten staff on their toes. There are designer bags, shoes, jewellery, dresses, skirts, jeans; all arranged on racks for easy browsing. There is also a sofa for relaxing and a few magazines if you need to take a breather. A Prada tube dress in shot silk with rosebuds is $215 instead of $600; a Carolina Herrera silk skirt is $168 instead of $500 or why not have some Armani trousers for $155 instead of $450? Items are all priced to sell and reduced after a month and then again. Items not sold are given to charity but 95% of the stock does find a paying home. Open every day, there is no pressure to buy but my bet is you will.